Slip Energy Recovery is one of the methods of controlling the speed of an Induction motor. This method is also known as Static Scherbius Drive. In the rotor resistance control method, the slip power in the rotor circuit is wasted as I2R losses during the low-speed operation. The efficiency is also reduced. The slip power from the rotor circuit can be recovered and fed back to the AC source so as to utilize it outside the motor. Thus, the overall efficiency of the drive system can be increased. The figure below shows the connection and method for recovering the slip energy and power recovery of an Induction Motor. The basic principle of the slip power recovery is to connect an external source of the EMF of the slip frequency of the rotor circuit. The slip energy recovery method provides the speed control of a slip ring induction motor below its synchronous speed. 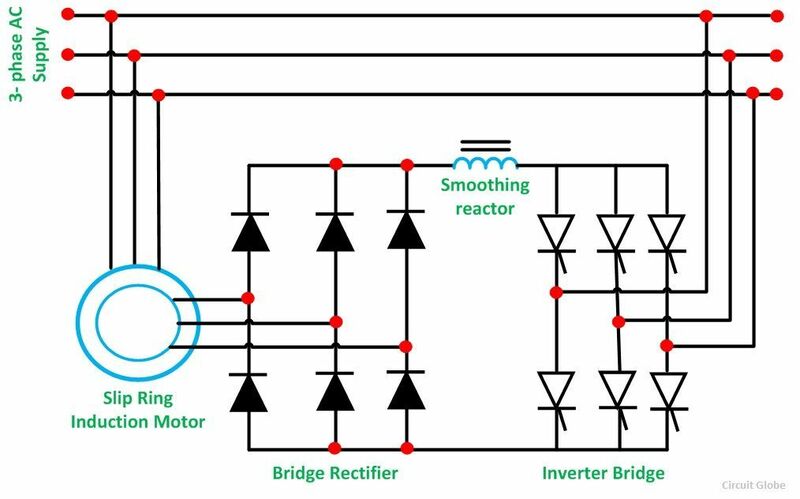 A portion of rotor AC power (slip power) is converted into DC by a diode bridge. The smoothing reactor is provided to smoothen the rectified current. The output of the rectifier is then connected to the DC terminals of the inverter. The inverter inverts the DC power to the AC power and feeds it back to the AC source. The inverter is a controlled rectifier operated in the inversion mode. This method of speed control is used in large power applications where the variation of speed over a wide range involves a large amount of slip power.